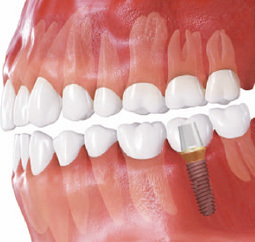 When a single tooth is missing, the two most common treatment options are the traditional tooth supported dental bridge or an implant supported crown. 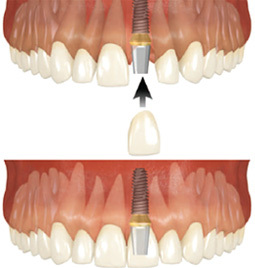 When a traditional bridge is used to replace a missing tooth, the adjacent teeth are drilled down in order to fit the cemented bridge in place. 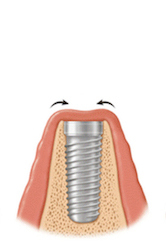 This method of tooth replacement can be very esthetic and functional for a period of time. However, adjacent teeth are forever compromised, and a tooth supported bridge does not replace the bone that previously surrounded the root. Since there is no longer a root to hold the bone in place, the bone deteriorates, or melts away. 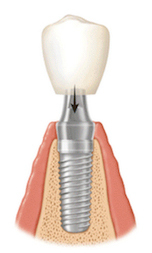 The implant is inserted into the bone with minimal drilling. The gums will grow over the surgery site in about 14 days. It takes aprox. 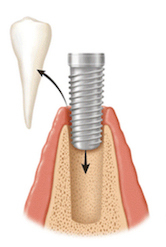 two (2) to six (6) months of healing for the bone around the implant to be strong enough to support a tooth. While the bone is healing, a removable temporary single-tooth denture is worn for proper function & esthetics during the implant healing phase. The implant is uncovered with a laser. 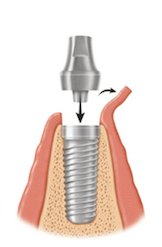 A biocompat-ible titanium abut-ment is inserted into the implant. An impression is taken. 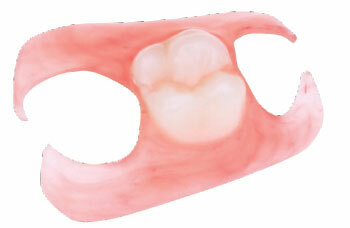 It is sent to a lab for fabrication of an IPS e-max crown.